Nintendo’s greatest skill will always be game design. Whatever else you might think about Nintendo games, their design is often exquisite, relying on elegant visual and gameplay cues and your natural curiosity to guide you rather than tutorial prompts and objective markers. People who’ve grown up with Nintendo are fluent in the language of this design, but it’s still intelligible to those who haven’t - hence Nintendo’s enduring popularity with families. Another of its great skills, though - and this is something that’s especially evident in the company’s latest spate of Wii U games, which includes Kirby and the Rainbow Paintbrush, Yoshi’s Woolly World and Captain Toad’s Treasure Tracker - is the art of cute. Nintendo’s studios are masters of the art of cute. I spent the weekend with Yoshi’s Woolly World and it is so cute it makes me emit involuntary noises. It is cuter than a basket of kittens with bows on. It is sweet enough to make your teeth hurt. I can hardly bear it. This handmade aesthetic begun with Good-Feel’s Kirby’s Epic Yarn in 2010 and evidently proved popular at the company, because both Kirby and the Rainbow Paintbrush and Yoshi’s Woolly World took the style and ran with it. Worlds and creatures made out of clay or wool have the double advantage of being adorable and original. It has the same heartwarming, creativity-nurturing effect as LittleBigPlanet, which almost certainly inspired it. Kirby and the Rainbow Paintbrush is cute in the same way, whereas things like Animal Crossing dip a toe into the Spongebob universe of weird-cute, and Mario goes with a shiny, colourful, touchable toy-like aesthetic. Then there are things like Game Freak’s Pokemon series, which borrows from anime style for its appealing characters and critters, and Captain Toad’s Treasure Tracker, which has the cutest animation I’ve ever seen. Wind Waker’s brand of cute, meanwhile, has just a touch of menace to it, in the Moblins’ crazy eyes and lolling jaws. 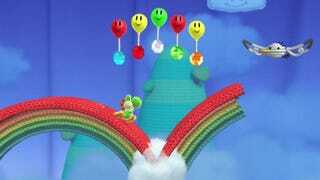 It feels like Nintendo has gone weapons-grade adorable lately; Yoshi’s Woolly World features not one, not three, but tens of little knitted Yoshis in different cute little patterns. When they’re all walking around together chirruping at each other it’s almost nauseating. Even the recent ADVERTS are lethally cute. Thankfully there’s since been a renaissance in cute, driven partly by the explosion of indie and mobile games with wonderfully varied artistic direction. There seem to be about 12 newly-released platform/adventure style games on the first few pages of the Steam store at any one time, most of them modelled after the blue-sky cuteness of the games of our youth. Shovel Knight and Broken Age are both creatively cute. None of us can stop playing this ridiculously adorable mobile game called Neko Atsume. On the bigger-budget side, Media Molecule is flying the flag for cuteness in the UK with Tearaway and, previously, the LittleBigPlanet series. There’s this chibi re-interpretation of Monster Hunter on the horizon. Sony’s mega-cute Japanese mascot Toro had his own (Japanese) daily show on Playstation for a good three years, from 2006 to 2009; it is a great tragedy that it didn’t survive the PS3 era. I still think that there is nobody as good at Nintendo at making cute video games, and certainly nobody is devoting the same resources to making games that make you squee. But it has a lot more competition now than it did for a while. I hope that carries on, and that those grey days of the mid ‘00s never return.